The MPD controller for the iPhone and iPod Touch. MPDluxe lets you control your MPD music server from your iPhone or iPod Touch, quickly and effortlessly. 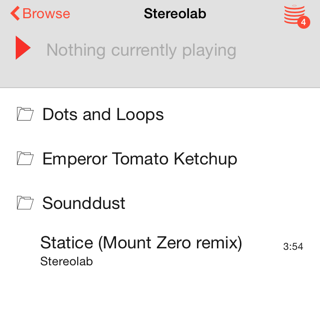 Play, pause, skip, browse and build your playlist, all from the palm of your hand. MPDluxe connects to your MPD server over your home WiFi network. As soon as a connection is established, MPDluxe is ready to browse your music collection, control playback and player state. MPDluxe was designed from scratch for iOS 8, and takes advantage of the latest iOS technologies and design practices. MPD (the Music Player Daemon) is an open-source music playing server that runs on UNIX and Linux computers. MPD stores your digital music collection, listens for commands over your local network and plays music on command. MPD is free software; you can learn more about it at musicpd.org. The browser view lets you browse your music collection, play tracks immediately or add them to the playing queue. 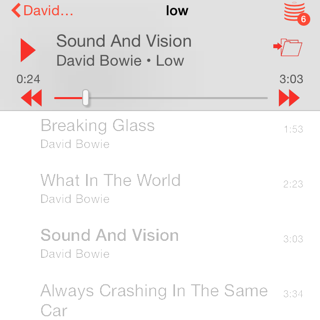 The playlist drawer shows the tracks queued for playing, and allows you to remove or rearrange tracks.. 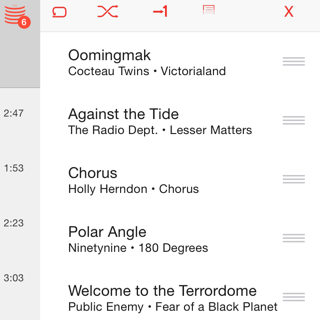 The player controls are always visible, allowing you to pause, play, skip or seek in the currently playing track. © Kineticfactory 2015. MPDluxe is not officially affiliated with or endorsed by the MPD project.